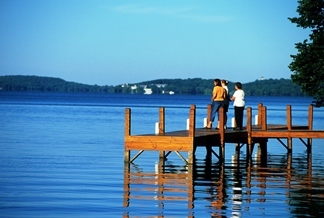 The Water Way charts the course for the Wisconsin Lakes Partnership for the first decade of the twenty-first century. S Since its genesis in the early 1970s, the Wisconsin Lakes Partnership has been recognized as a nationSal model of collaboration. Three groups form the core of this team: the Wisconsin Department of Natural Resources (WDNR) supplies the technical expertise and regulatory authority; the University of Wisconsin-Extension (UWEX) builds linkages among stakeholders and provides supporting educational materials and programs; and local lake people are the third group, represented by the Wisconsin Association of Lakes (WAL). Citizen volunteers from around the state - lake organizations, property owners, and local governments - provide the political will and hard work to accomplish watershed restoration and lake protection goals. We are all concerned with the futureS of our lakes, and have joined together in active cooperation and conscientious planning for lake protection. The Partnership belongs to everyone concerned with the future of our state’s waters. Individuals, business partners, small groups and large organizations have all rolled up their sleeves to lend a hand. The Wisconsin Lakes Partnership is a statewide, multi-faceted effort. If it has to do with lakes, the “Lakes Partnership” is probably involved. Partnership activities include citizen volunteer monitoring, research, youth and adult training and education, aquatic plant protection, pollution prevention, invasive species education, water recreation planning, land and water regulation, and community assistance grants.